In September I had the opportunity to visit Fukushima City, Japan, as a guest of Takayuki Takahashi, Vice President of Fukushima University. I first met Professor Takahashi in June, when he and his team of researchers attended a medical trade show in New York City. Almost as much as he wanted to promote the school’s medical invention, he wanted to promote the resilience of Fukushima residents after the horrific earthquake and tsunami of March 11 set off a nuclear crisis. When I contacted the professor in August to let him know I was going to Japan, he asked me if I would consider spending a day in Fukushima to see the “normal daily life.” This piece is a summary of my ten hours in an area that is anything but normal. Then Professor Takahashi pulled a sievert meter from a Godiva chocolate shopping bag. Looking as if it belonged in a Sci-fi movie, this device measures microsieverts (µSv), the units of radiation absorbed by the body. I would soon learn that carefully monitoring radiation levels has become the new normal in communities surrounding the stricken Fukushima Dai-ichi Nuclear Power Plant. Professor Takahashi is not a nuclear specialist, but rather he’s a member of Fukushima University’s faculty of Symbiotic Systems Science, where he specializes in the field of robotics. I’m not a scientist, but I wrote a story about the robotic medical invention the professor and his team presented at the Medical Design and Manufacturing East Exposition (MD&M East) at the Javits Center. When Takahashi was in New York, he wanted to show that, three months after a 9.0-magnitude earthquake triggered a massive tsunami and unleashed a nuclear crisis in Japan, the area – and even the nation – was moving toward recovery. Almost six months after March 11, Professor Takahashi is still conveying that message. I was in Japan to cover and participate in the JapanBall tour, attending five professional baseball games in five different cities. I routinely e-mail friends and colleagues before a visit to Japan, and since I was impressed by Professor Takahashi during our initial meeting, I decided to reach out to him. A few of my Japanese friends who live in America had advice ranging from “Don’t go” to “Go, but don’t eat anything” in response Professor Takahashi’s invitation. Considering the offer a special opportunity to see first-hand how things have (or haven’t) changed in the beleaguered prefecture, I accepted with curiosity, enthusiasm, and mild trepidation. “You can’t really say you have a ‘normal daily life’ when you check radiation levels every day,” I said to Professor Takahashi, gesturing toward the radiation-measuring apparatus. Oh yes, radiation. It can’t be seen or felt or tasted. But it can be measured, and the professor checked the readings on his sievert meter throughout the day like a businessman checking his smart phone. “Radiation occurs naturally,” Professor Takahashi explains, “and a normal reading is 0.05 µSv.” That day’s reading at the Fukushima City train station: 0.07 µSv. The first stop on my tour of Fukushima was a junior high school. We were shown around by Eiichi Saito, principal of the junior high school, and Kyoko Hamajima, the director of the adjacent kindergarten. It seemed as if the students had settled into a normal routine of attending classes. Student teachers were being graded on how they conducted their lessons. Shoes occupied their usual spots in cubbyholes placed throughout the buildings. Bulletin boards sprang to life with colorful messages about upcoming activities. Despite appearances, something extraordinary happened here, and things are not completely normal. Of the 480 students enrolled at the school, eleven withdrew because their families relocated to different cities due to radiation concerns. When cesium-137 was detected in the top five centimeters of soil on school grounds, officials buried the contaminated soil five feet underground. Cesium-137, a product of the fission of uranium and plutonium, was released into the atmosphere during the accident at Fukushima Dai-Ichi Nuclear Power Plant on March 11. Particles from the fallout settled in Fukushima City, 50 miles away. 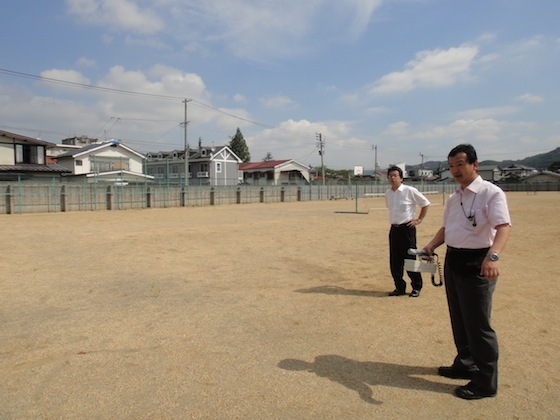 Principal Saito gave us a tour of the grounds and showed us the fenced-in square of land containing the buried soil. 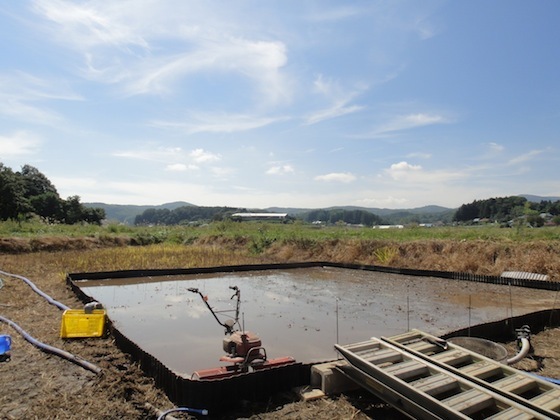 During the decontamination process, the affected soil was covered in mid-May with dirt brought in from Shiroishi, a town in Miyagi Prefecture 20 miles to the north, Saito says. Elsewhere at the school, a swimming pool – filled with water – sits unused. The swim team’s training was suspended due to safety concerns from parents. Unlike in the United States, the Japanese school year begins in early April. The Japanese government deemed Fukushima City safe enough for area schools to open on April 8, five days later than schedule and less than one month after the disaster. It is important to Hamajima to have a consensus among the parents of her kindergarten students where safety issues are concerned. Since the onset of the nuclear crisis, the kindergartners have played in the gymnasium rather than outside. Months later, when Hamajima proposed that it was safe for the children to play outdoors, all but five parents agreed. Since there was no consensus, the children continue to spend recess indoors. Professor Takahashi is an intelligent man whose face shows no signs of stress despite the hardships that have befallen his country. When discussing the nuclear crisis and radiation levels in Fukushima Prefecture, he speaks matter-of-factly and explains the science in layman’s terms. Armed with Fukushima University’s state-of-the-art sievert meter and a scientific background, he admits he has a base knowledge of radiation, which helps him understand the nuclear situation better than the average citizen. Although he feels that the government’s information about the goings on at the disabled nuclear power plant is enough for him to digest, he acknowledges that it may not be the case for the rest of the general population. Before the disaster, Fukushima City was home to roughly 300,000 people. It is estimated that as many as 12 thousand residents moved to other parts of Japan as a result of the nuclear crisis. Despite a lack of knowledge and a perceived panic, people continue to reside in Fukushima City, which is 50 miles from the nuclear disaster, barely outside of the government’s mandatory evacuation zone. After leaving the school, we inched closer to that zone, to the village of Iitate. Just 25 miles from the hobbled nuclear power plant, Iitate is a small town that’s technically outside of the exclusion zone. However, due to high radiation readings, residents were asked to evacuate in late April. About half of the population of 6,200 did so. 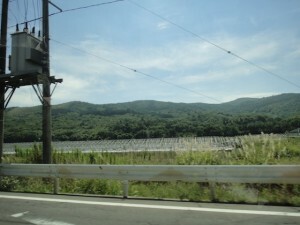 Fukushima Prefecture is an agricultural area known for rice production. It is also one of Japan’s top producers of fruit (peaches, apples, pears), tomatoes, and cucumbers. Iitate is a village of farmland, and I noticed lush green fields – crops that are not safe to eat – as I stared out of the window of the car. I also noticed overgrown crops, a grim reminder of the farmers’ evacuation. As we approached the town limits, the radiation levels rose from 0.7 µSv to 1.21 µSv, about the same amount of radiation you would receive if you had an arm X-ray. When we arrived at the Iitate village hall, the radiation levels in the parking lot read above 4.00 µSv, slightly lower than a dental X-ray (5.00 µSv). Inside the government building, however, the level dropped below 1 µSv. Tomeji Honda of the local Iitate government informed us that soil decontamination was taking place on that day, and we were allowed to observe. 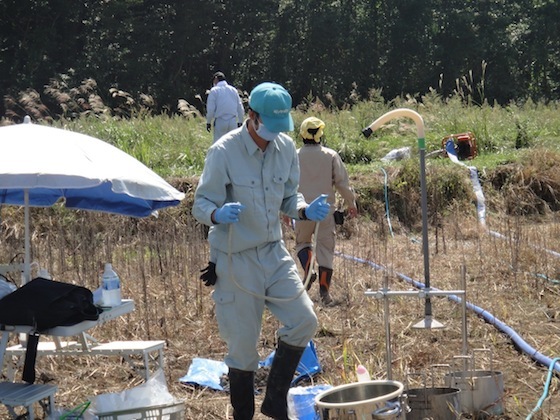 We met Ichiro Taniyama, the director of the Natural Resources Inventory Center at the National Institute for Agro-Environmental Sciences, in an open field as he and his team decontaminated a small patch of soil. We weren’t the only ones interested in watching; NHK sent a two-man crew to videotape the process. The radiation level at the field: 6.00 µSv, the highest of the day. As the late-morning sun beat down, men in coveralls, rubber boots, masks, and gloves were busy testing the pH balance of the soil that they were siphoning from land 100 feet away. A system of hoses brought the soil to a vat where the cesium was removed. The remaining soil was then mixed with water and returned to the land. “Right now we have it in that container,” says Taniyama, pointing to a round concrete vat. The vat was sitting against the edge of the road, covered only by a blue tarp. Lunchtime. A moment I’d been dreading. Professor Takahashi was enthusiastic about introducing me to the regional dishes of the prefecture. I was less than enthusiastic about the possibility of consuming irradiated food. 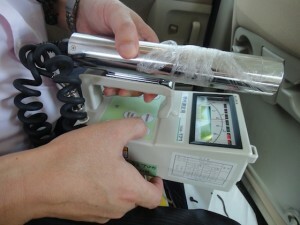 As the car descended the hills toward Fukushima City, so did the reading on Professor Takahashi’s sievert meter. As the level dropped from 6 µSv in Iitate to the less stressful reading of 1 µSv, I began to feel more comfortable in my surroundings. And hungry. We arrived at a beautiful traditional Japanese restaurant, where we met two more of Professor Takahashi’s colleagues and sat in a tatami mat room to enjoy a multi-course meal. It was exquisitely prepared and presented in the aesthetically pleasing way that the Japanese do best. As I sampled the bounty of delicious cuisine from Aizu in western Fukushima Prefecture, I took into account that my hosts eat in Fukushima every day. I let go of my initial fears of eating contaminated food and I savored the meal, thankful for the opportunity to share it with these people. I ended my day in Fukushima City where it began: At the train station. Masako Tai, a secretary in the office of Professor Takahashi’s department who was kind enough to drive us to all of our appointments, kept me company until it was time to board. Once on the train to Tokyo, my mind was racing from the events of the day. I’d learned many things about and come close – perhaps too close – to an area that is in the midst of a nuclear calamity. Japan is no stranger to recovering from nuclear disaster, having suffered the dropping of two atomic bombs during World War II. As a demonstration of their resolve, the Japanese typically respond to such crises by picking up the pieces and living life. The people of Fukushima are doing just that. But the current situation is as unique as it is familiar. The people of Fukushima – and all of Japan, for that matter – will be recovering from this three-pronged challenge of earthquake/tsunami/nuclear dilemma for decades to come. As the bullet train sped away from the hard-hit region, I thought of Professor Takahashi’s neutral statements that neither criticized nor praised the Japanese government’s handling of the country’s nuclear crisis. I thought of the drained look on Ichiro Taniyama’s face in his attempt to decontaminate northeastern Japan a few acres at a time. An ordinary life led under extraordinary circumstances. Susan, great read, you really take us there. I’m impressed by your bravery to tell this story. Thanks, Sachi! I appreciate it. It was an eye-opening experience that I’ll never forget. My name is Kellie Addison and I work for a television station in New Zealand. After reading your incredibly moving account of life in Fukushima I was wondering if I would be possible to conduct a skype interview with you about that day… It would be screend on one of our daily news shows. It wouldnt take more than 5-10 minutes and we are flexiable with times and dates. I look forward to hearing from you. News and Current Affiars Producer, TVNZ News. Thank you so much. I’d love to do a Skype interview with you. Send me an e-mail at susan@japanculture-nyc.com, and we can work out the details. I really enjoyed the article because we don’t hardly hear about it any more in the media. and we, Japanese Bible Study Group in Goldsboro, NC, is praying for the people who survived the disasters and wondering about how they are getting along. Thank you, Merry-san! I’m glad this story was able to give you some information, even though I didn’t visit badly damaged areas. There’s still so much work to be done, but the people living in Fukushima are strong. I think about the people I met there every day. Next Next post: Nissan is Building New York's "Taxi of Tomorrow"